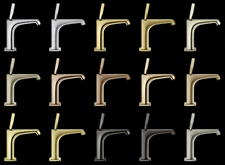 The Hansgrohe range is divided into two different brands. Hansgrohe is named after Hans Grohe, who founded the company in 1901. Hansgrohe is synonymous with innovative sanitary products from the Black Forest: durable, top quality and environmentally friendly. Axor works with world-renowned designers and interior designers to develop premium products, comprehensive bathroom collections and complete bathroom concepts. The Axor brand has been on the market since 1993. Both brands enable your customers to create customised bathrooms and kitchens. For the best possible overview of our range of products, you will find several ways to access them here: for example, sorted by brand or by product category or even by other services. This includes, for example, the spare parts search. For each respective product, you are given detailed information required for your day-to-day work: dimensional drawings, installation and service instructions, bathroom planning data and lots more. Is your customer looking for a multi-functional shower or mixer? Would they like to add a whole new dimension to the fun they can have with water? 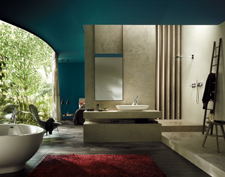 With a wide range of high-quality products, Hansgrohe is more than capable of fulfilling all requirements. To suit all budgets and age groups. Our designer brand. Anyone looking for customised collections created by renowned designers and products for the bathroom and kitchen need look no further. 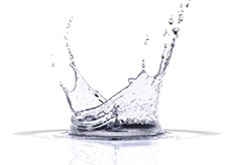 Is your customer looking for a shower or mixer for the bathroom or kitchen? A bath tub, wash basin, waste system or accessory? 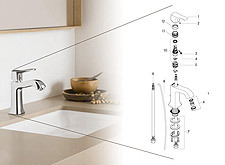 Here you are provided with an overview of Axor and Hansgrohe products. Thousand and one bathroom ideas, key information about the products of Hansgrohe and Axor as well as interesting facts about the company. 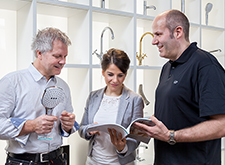 With Hansgrohe, your customers expect functions and products with genuine added value and a quality seal. Everything you have always wanted to know about our products and services: the most frequently asked questions, care and cleaning advice and our guarantee services. Wherever a component may be missing, whenever a product is no longer available – here you will find all information regarding spare parts. Includes online installation manuals, exploded drawings and lots more. Customised spout lengths or mixer heights, coloured and particularly resistant surface finishes, special inscriptions are all offered, plus lots more besides. Rather than spending ages searching, wouldn't you prefer to have all the information available at a glance? From here you can directly access all products – with a practical filter function.